Check out our Birthday Cards here! 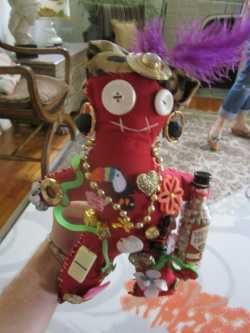 Lovehateluckdolls were inspired by Louisiana Voodoo dolls. They incorporate many elements of traditional New Orleans Voodoo, but with a special Florida spin. These dolls can use be used decoratively, they can be used in magic spells, or they can be given as gifts. We offer love dolls, hate dolls, luck dolls, protection dolls, peace dolls, dream dolls, Juju (lucky) cats, juju dogs, sports themed dolls, painted cigar and wine boxes, day of the dead skulls, greeting cards for all occasions, curiosity boxes, paintings, and political themed dolls and cards. As the conjurer, affix a photograph of your target over the doll’s face and attach their hair if possible. Pin the ace of spades through the doll’s heart this will sabotage any romantic prospects they may have. Use the orange thread/ribbon to bind the doll’s hands, this will prevent the person from accomplishing what they are attempting to do. Use the remaining needles and apply them to the following locations on the doll: Stomach, neck, back, heart, knees, and eyes. Each hate doll is hand sewn with hate. 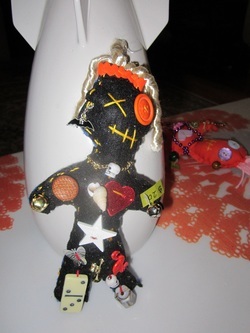 Each hate doll contains: newspaper obits, black poppy seeds, black pepper, and dirt dobber nests. As the conjurer, affix a photograph of your target over the doll’s face and attach their hair if possible. If you would like the target to fall in love with you: place the doll in a mason jar with either honey or sugar, close the lid. Then write their name on brown paper in the Theban alphabet (included in this kit) then write your name crossing your potential lovers name in the Theban alphabet. Place the paper on top of the jar. Light a pink candle and place it on top of the paper. While lighting the candle think about the target and repeat their name, 3 times if they are a man, 4 if a woman. If you would like to spice up a current relationship, do the same as above but light a red candle. You can also carry the doll in your pocket to attract your target, right side if you are a man and left side if you are a woman. Each Love Doll is hand sewn with love. In the center of each love doll is both wild Brazilian patchouli (for protection) and the herb dill which fosters romantic feelings. Each doll is spritzed with perfume. When gambling or dealing with anything financial carry the doll in your pocket, the right side if you are a man and left side if you are a woman. Write your intentions (winning a game of chance, business success, prosperity, etc) on a piece of brown paper. Tie it to your doll with green and gold ribbon. Holding your doll in one hand (right if a man, left if a woman), light either the green or yellow candle, and star into the flame, thinking of your intentions for nine minutes. 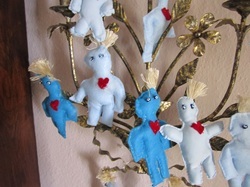 Each Luck Doll is hand sewn with thoughts of good fortune. 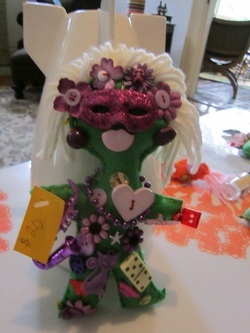 In the center of each luck doll is wild Brazilian patchouli (for protection), a penny, black eyed peas, and the following herbs which prompt good luck and financial success: nutmeg, mint, bay leaf, clove, and thyme. As the conjurer, affix a photograph of your target over the doll’s face and attach their hair if possible. Pin the Ace o' Spades through the doll’s heart this will sabotage any romantic prospects they may have. Use the black ribbon to bind the doll’s hands, this will prevent the person from accomplishing what they are attempting to do.Use the remaining needles and apply them to the following locations on the doll:Stomach, neck, back, heart, knees, and eyes. See more Deluxe Hate Dolls here! 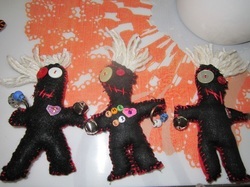 Each Deluxe Hate Doll is hand sewn with hate. 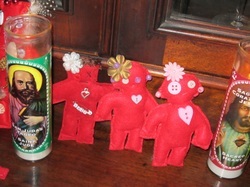 In the center of each doll is cayenne pepper, a dirt dobber nest, and newspaper obituaries. Nine charms are sewn onto the outside of each doll. SEE MORE DELUXE FEMALE HATE DOLLS HERE! When gambling or dealing with anything financial carry the doll in your right pocket (right side). Write your intentions (winning a game of chance, business success, prosperity, etc) on a piece of brown paper. Tie it to your doll with green and gold ribbon. Holding your doll in your right hand, light either the green or yellow candle, and stare into the flame, thinking of your intentions for nine minutes. Place the doll in your business or office and moneywill find you. Giving the luck doll as a gift brings luck to both the giver and receiver. 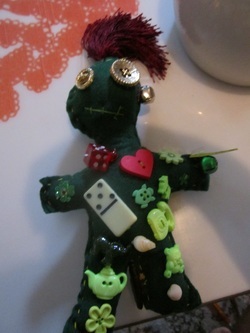 Each Luck Doll is hand sewn with thoughts of good fortune. 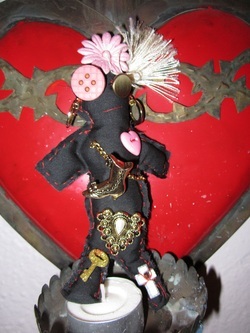 In the center of each luck doll is wild Brazilian patchouli (for protection), a penny, black eyed peas, and the following herbs which prompt good luck and financial success: nutmeg, mint, bay leaf, clove, and thyme. Nine lucky charms are sewn onto the outside of each doll. See more Deluxe Luck Dolls here! When gambling or dealing with anything financial carry the doll in your left pocket (side). Holding your doll in your left hand, light either the green or yellow candle, and stare into the flame, thinking of your intentions for nine minutes. Place the doll in your business or office and money will find you. 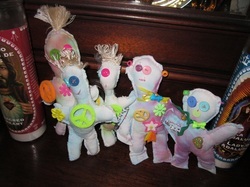 sewn onto the outside of each doll. As the conjurer, affix a photograph of your male target over the doll’s face and attach their hair if possible. If you would like the target to fall in love with you: place the doll in a mason jar with either honey or sugar, close the lid. Then write their name on brown paper in the Theban alphabet (included in this kit) then write your name crossing your potential lovers name in the Theban alphabet. Place the paper on top of the jar. Light a pink candle and place it on top of the paper. While lighting the candle think about the target and repeat their name, 3 times if they are a man, 4 if a woman. Each Deluxe Love Doll is hand sewn with love. In the center of each love doll is both wild Brazilian patchouli (for protection) and the herb dill which fosters romantic feelings. Each doll is spritzed with perfume. Nine charms are sewn onto the outside of each doll. See more Deluxe Love Dolls here! As the conjurer, affix a photograph of your female target over the doll’s face and attach their hair if possible. If you would like the target to fall in love with you: place the doll in a mason jar with either honey or sugar, close the lid. Then write their name on brown paper in the Theban alphabet (included in this kit) then write your name crossing your potential lovers name in the Theban alphabet. Place the paper on top of the jar. Light a pink candle and place it on top of the paper. While lighting the candle think about the target and repeat their name, 3 times if they are a man, 4 if a woman. If you would like to spice up a current relationship, do the same as above but light a red candle. You can also carry the doll in your pocket to attract your target, right side if you are a man and left side if you are a woman. Each Female Deluxe Love Doll is hand sewn with love. In the center of each love doll is both wild Brazilian patchouli (for protection) and the herb dill which fosters romantic feelings. Each doll is spritzed with perfume. Nine charms are sewn onto the outside of each doll. Instructions:Hang the doll by a doorway in your home or place of work. The evil eyes of the doll will repel evil and evil thoughts. Carry the doll with you in your pocket or purse. Light the blue and white candles in front of the doll and chant a mantra or prayer when you feel you need protection. 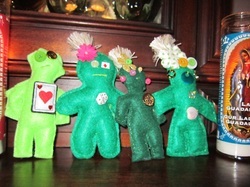 Each protection doll is stuffed with patchouli and basil leaves for protection. Evil eye beads, the kind traditionally seen in the Mediterranean, are sewn on as the dolls eyes. The dolls come in various shades of lighter blues. Kit includes a blue and a white candle.